Ever since the days of ancient Egypt, priesthoods of various denominations have had an alliance with the state. They trained the next generation of literate bureaucrats. The state wanted literate bureaucrats. The priesthood wanted state support. It was a convenient alliance. It still is. In our day, the priests are priests because they are certified by the state to do the training. This is called academic accreditation. The priests are agents of the state. All of this has rested on a myth: the myth of classroom education. In less than 10 years, the Khan Academy has undermined this myth beyond repair. 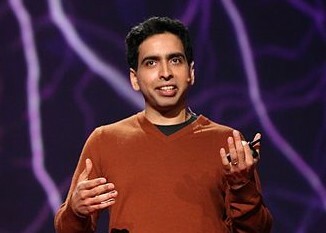 According to its website, the Khan Academy now has 26 million registered students. Registered. Not just dropping in to see videos, but actually registering. The Khan Academy went online in 2006. This means that, in just nine years, it has grown to the largest educational institution in the history of mankind. This growth is accelerating. One man, with no formal training as a teacher, single-handedly has taken over the education of at least 26 million students. Think about what this means for the educational establishment. They have claimed for over a century that a teacher must have specialized training in order to become an effective teacher. He must spend years in specialized classes in state-accredited universities in order to be sufficiently competent to teach a roomful of 30 students at a time. But Khan is teaching 26 million students at a time. It is now too late to stop him. There have been too many people who have come on board to praise the operation. There have been no major critics who have gained an audience. Nobody inside the educational establishment has been able to stop this avalanche which is rolling down the side of tenure mountain. The videos are now being used in public schools. He is going to be training a generation of high school science students. He will add other courses soon enough. He has proven that by paying somebody nothing, that person can become the primary teacher in 100 classrooms, 10,000 classrooms, or 100,000 classrooms. If the students can speak English, he becomes the primary teacher. He has turned the entire teaching establishment into the equivalent of teachers’ aides. What does this do to the myth of the certified teacher? What does this do to over a century of progressive education? My father-in-law R. J. Rushdoony wrote a classic book, The Messianic Character of American Education (1963). It is a history of two dozen of the major figures in the coming of tax-funded education. He went back to the primary sources, as nobody else ever had, to show exactly how the founders of progressive education believed that the public schools would serve as an alternative to the Christian church. They saw it as redemptive institution. Now, one man, with no financial backing initially, has undermined the entire theology of progressive education. He is not dumbing down the material. Anybody can get online and master the material. You can watch a video 10 times. The educational establishment has nothing to do with the project, other than employing specialists in testing. There is no ideology to this program. There is no theology of redemptive state funding. The state had nothing to do with this program. It is a one-man show. Basically, in less than one decade, one man undermined the entire theology of the progressive education movement. Critics of progressive education have come and gone, and they have had zero effect in rolling back the system. Now one man has obliterated the entire theology. His videos have infiltrated the public schools of America. Every time a student watches one of his videos, another pillar of progressive education is knocked down. That student is being taught by someone who never went through this screening process of state licensure and certification. In the next recession, when public school budgets come under fire again, what are the tenured bureaucrats going to say when the local school board calls for a doubling of the size of the high school classrooms, with one teacher and one low-paid teacher’s assistant doing little more than taking roll? The teachers have already abdicated. What will all the graduates of the teacher institutions do then? If they teach kindergarten through fifth grade, they may have jobs, but high school teachers can forget about careers. The myth of the tenured teacher goes back to ancient Egypt. The priests controlled the supply of literate people. This is a major source of control by priesthoods, which were always in alliance with the state. Now there is no way to control the flow of information into the households of the masses. I have been contacted by a graduate of medical school about the possibility of creating a one-year course in the Ron Paul Curriculum on the basics of medicine. In other words, it would be an introductory course that we might call a pre-pre-med course. He is willing to do it for free, but of course we will pay him if he produces the course, and if students want to take the course. He is dedicated. He wants to get the message out. He could do it himself online if he really wanted to. There are going to be innovators in every field who do this. The secrecy associated with ancient guilds is going to be broken. At some point, some law school graduate who got all A’s and who passed the state bar exam is going to start putting on free courses for the general public on the intricacies of the legal system. Others will imitate him. Students are going to be able to get an education that is better than most state law schools. They will be able to pass the bar. On what basis can they be stopped? Why is it necessary to go through the classroom training, if the online training is just as good, and the students can pass the bar? How will the tenured bureaucrats secure their position under these conditions? Then it goes to medicine. Then it goes to architecture. It goes to every field. If a student can come out of a free online curriculum on YouTube, and he can pass whatever entry exam is required, what becomes of the justification for the modern university system, which absorbs half a trillion dollars of mostly public money every year? The myth of classroom education is dying. Classroom teachers have always insisted that you cannot learn in the context of distance learning. There has never been any statistical evidence to show this. But the tenured bureaucrats want to spread the gospel of the necessity of classroom performance. Salman Khan has single-handedly destroyed that mythology. It’s basically gone. This has never happened in human history. In less than one decade, he destroyed the foundations of this myth. This is going to undermine the state. This is going to undermine the whole state certification system. As long as free online videos train a person to pass a competitive exam, there is no justification for the public support of the infrastructure that enables people to pass the exam. It will become clear soon enough that the whole policy of screening by means of a costly classroom is no longer valid from an educational standpoint. The classroom screeners are going to have to find another line of work. As long as any profession screens in terms of a final entrance exam, it will not matter how the person who passes the exam got the training to pass the exam. If the exam is valid as a screening device, then the entire classroom empire is an exercise in the reduction of supply of qualified candidates to pass the exam. Anyone whose income is dependent upon the screening device of a graduate school program to reduce the supply of future competitors had better wake up and smell the coffee.